This tutorial is derived from a week-long Redex summer school, run July 27–31, 2015 at the University of Utah. What we want: develop LC as a model of a PL. Because of history, this means two things: a simple logic for calculating with the terms of the language e == e’ and a system for determining the value of a program. The former is the calculus, the latter is the semantics. All of the above is mathematics but it is just that, mathematics. It might be considered theory of computation, but it is not theory of programming languages. But we can use these ideas to create a theory of programming languages. Plotkin’s 1974 TCS paper on call-by-name versus call-by-value shows how to create a theory of programming languages. In addition, Plotkin’s paper also sketches several research programs, mostly on scaling up his ideas to the full spectrum of languages but also on the precise connection between by-value and by-name their relationship, both at the proof-theoretical level as well as at the model-theoretic level. Start from an abstract syntax, plus notions of scope and scope-preserving substitution. Consider closed terms Programs. Identify a subset of expressions as Values. Use v to range over Values. Note The complement of this set was (later) dubbed computations, due to Moggi’s work under Plotkin. Inductively generate an equational theory from the basic notions of reduction. Prove that eval is a function, and you have got yourself a specification of an interpreter. Note This step often reuses a variant of the Church-Rosser theorem of the mathematical theory of lambda calculus. Standard reduction is a strategy for the lambda calculus, that is, a function that picks the next reducible expression (called redex) to reduce. Plotkin specifically uses the leftmost-outermost strategy but others may work, too. Plotkin also shows—on an ad hoc basis—that this evaluator function is equivalent to Landin’s evaluator based on the SECD machine, an abstract register machine. The interpreter of a programming language (non-constructively) generates a theory of equivalence on phrases. Theorem ~ is the coarsest equivalence theory and thus unique. Let’s call ~ the Truth. Theorem e = e’ implies e ~ e’. Naturally the reverse doesn’t hold. 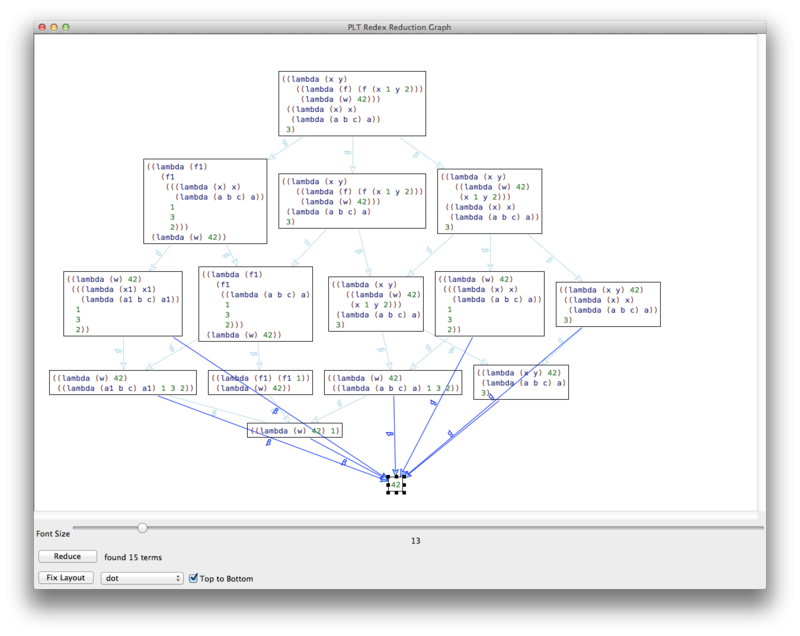 Plotkin’s “algorithm” applies to imperative programming language, especially those extending the lambda calculus syntax with (variable) assignment and non-local control operators. Imperative Extensions explains how two of these work. For each of these functions, we can prove an equivalence theorem. His work also shows how this approach greatly simplifies proofs of consistency for the semantics of programming languages and especially so-called type soundness theorems. The trees are somewhat concrete, which makes it easy to work with them, but it is confusing on those incredibly rare occasions when we want truly abstract syntax. We can include literal numbers (all of Racket’s numbers, including complex) or integers (all of Racket’s integers) or naturals (all of Racket’s natural numbers)—and many other things. Mouse over define. It is not a Redex form, it comes from Racket. Take a close look at the last definition. Comma anyone? Make sure your language contains the terms that you want and does not contain those you want to exclude. Why should eb1 and eb2 not be in Lambda’s set of expressions? To make basic statements about (parts of) your language, define metafunctions. Roughly, a metafunction is a function on the terms of a specific language. We don’t want parameter sequences with repeated variables. Can we say this with a metafunction? The second line is a Redex contract, not a type. It says unique-vars consumes a sequence of xs and produces a boolean. How do we say we don’t want repeated variables? With patterns. Patterns are powerful. More later. But, don’t just define metafunctions, develop them properly: state what they are about, work through examples, write down the latter as tests, then define the function. ; are the identifiers in the given sequence unique? Submodules delegate the tests to where they belong and they allow us to document functions by example. You may know it as the de Bruijn index representation. The best approach is to specify an α equivalence relation, that is, the relation that virtually eliminates variables from phrases and replaces them with arrows to their declarations. In the world of lambda calculus-based languages, this transformation is often a part of the compiler, the so-called static-distance phase. We have to add a means to the language to say “arrow back to the variable declaration.” We do not edit the language definition but extend the language definition instead. Guess what? (term (fv (lambda (x y) (if x y false)))) doesn’t work because false and if are not covered. We want metafunctions that are as generic as possible for computing such notions as free variable sequences, static distance, and alpha equivalences. The last thing we need is substitution, because it is the syntactic equivalent of function application. We define it with any having future extensions in mind. Exercise 1. Design bv. The metafunction determines the bound variables in a Lambda expression. A variable x is bound in e_Lambda if x occurs in a lambda-parameter list in e_Lambda. Exercise 2. Design lookup. The metafunction consumes a variable and an environment. It determines the leftmost expression associated with the variable; otherwise it produces #false. The language extension also adds numbers of the sub-language of expressions. Before you get started, make sure you can create examples of environments and confirm their well-formedness. Exercise 3. Develop the metafunction let, which extends the language with a notational shorthand, also known as syntactic sugar. produces the expected results. What are those? Note These notes deal with the λβ calculus, specifically its reduction system. The logical way of generating an equivalence (or reduction) relation over terms uses through inductive inference rules that make the relation compatible with all syntactic constructions. What does filling the hole of a context with a context yield? Developing a reduction relation is like developing a function. Work through examples first. A reduction relation does not have to be a function, meaning it may reduce one and the same term to distinct terms. ; does the one-step reduction reduce both β redexes? ; does the full reduction relation reduce all redexes? Let’s compare traces for the same term. You do get the same result but significantly fewer intermediate terms. Why? Note the tests-first development of the relation. The key is the stepper-loop, which applies the Racket function apply-reduction-relation repeatedly until it yields a value. Good models of programming languages are like Newtonian models of how you drive a car. As long as your speed is within a reasonable interval, the model accurately predicts how your car behaves. Similarly, as long as your terms are within a reasonable subset (the model’s language), the evaluator of the model and the evaluator of the language ought to agree. And now it’s time to discover. Also require "close.rkt" for the fv function. Consider equipping the one-step reduction relation with tests. Exercise 4. Develop a βη reduction relation for Lambda-η. Find a term that contains both a β- and an η-redex. Formulate a Redex test that validates this claim. Also use trace to graphically validate the claim. Develop the β and βη standard reduction relations. 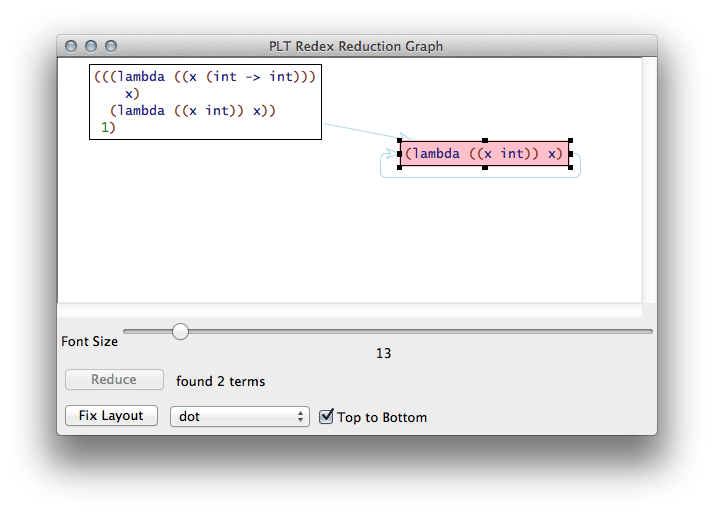 Hint Look up extend-reduction-relation to save some work. Use the standard reduction relations to formulate a semantics for both variants. The above test case, reformulated for the standard reduction, must fail. Why? Note The semantics for βη requires some experimentation. Justify your non-standard definition of the run function. The βη semantics is equivalent to the β variant. Formulate this theorem as a metafunction. Use redex-check to test your theorem. Note Why does it make no sense to add η to this system? Exercise 5. Extend the by-value language with an addition operator. Equip both the βv reduction system and the βv standard reduction with rules that assign addition the usual semantics. Finally define a semantics functions for this language. Hint Your rules need to escape to Racket and use its addition operator. The #:pred keyword argument supplies a Racket function that judges whether the intermediate expression type checks, using our type judgment from above. In addition to "common.rkt", you also want to require "tc-common.rkt" for this lab. Furthermore, if you copy code from Types and Property Testing, make sure to copy the tests and to adapt the tests as you develop the machines. Completing the above list is an ambitious undertaking, but do try to complete at least two or three of these tasks. This makes it like Racket, Scheme and Lisp, but unlike ML where you can mutate only data structure (one-slot records in SML and slots in arbitrary records in OCaml. Extending this table and looking up values in it, is a routine matter by now. The question is what the corresponding calculus looks like. See Lab Contexts and Stores. This use of the standard reduction relation is common because most researchers do not need the calculus. Instead they define such a relation and consider it a semantics. The semantics is a function, however, that maps programs to the final answers and possibly extracts pieces from the store. When non-local control operators come such as ML’s exceptions come into play, reductions become (evaluation-) context-sensitive. History This form of exception was actually introduced into Lisp as the catch and throw combination (contrary to some statements in Turing-award announcements). The question is what a standard reduction relation for such a calculus looks like. See Lab Contexts and Stores. Also require "extend-lookup.rkt". Feel free to copy code from Imperative Extensions but make sure to add tests. The exercises this morning are puzzles. Try your hands on them, but when you feel stuck, don’t hesitate to request help. A letrec mutually recursively binds the variables x ... to the values v ... and in e. The addition of letrec internalizes the store into the language. Adapt the existing relations. Develop terms that one-step reduce in several different directions via reductions that model assignment and/or variable derefences. Use trace graphs to demonstrate the idea. Note This calculus has naturally separated mini-heaps, but your system must extrude the scope of these heaps on occasion (when values are returned) and merge them. Exercise 9. Develop a standard reduction system and a semantics for exceptions. Note You need to use evaluation contexts for two distinct purposes. Exercise 10. Develop a semantics of for a control operator such as callcc. Request Check with one of us before you embark on this project. We want to make sure that (1) the operator isn’t too difficult and (2) not to easy to implement. We are also available for hints. Observation β and β_v redexes often take place repeatedly in the same evaluation context. On occasion they just add more layers (inside the hole) to the evaluation context. Let’s separate the in-focus expression from the evaluation context. Historically the two have been called control string (C) and control context (C). Observation The evaluation context of the CC machine behaves exactly like a control stack. Let’s represent it as such. General Idea The general idea is to show how valuable it is to reconsider data representations in PL, and how easy it is to do so in Redex. The two machines define the same evaluation function. Let’s formulate this as a theorem and redex-check it. Note When I prepared these notes, I found two mistakes in my machines. Observation Substitution is an eager operation. It traverses the term kind of like machine does anyway when it searches for a redex. Why not combine the two by delaying substitution until needed? That’s called an environment (E) in the contexts of machines (also see above). General Idea Universal laziness is not a good idea. But the selective delay of operations—especially when operations can be merged—is a good thing. Again, the two machines define the same semantics. Here is the theorem. In addition to "common.rkt", you also want to require "close.rkt" for this lab. Furthermore, if you copy code from Abstract Machines, make sure to copy the tests and to adapt the tests as you develop the machines. Start with the CS reduction system and develop the CESK machine, re-tracing the above machine derivation. David Van Horn presented his tutorial on Abstracting Abstract Machines in Redex. ;; is the given value in the expression language? ;; (in x x_1 ...) is x a member of (x_1 ...)?